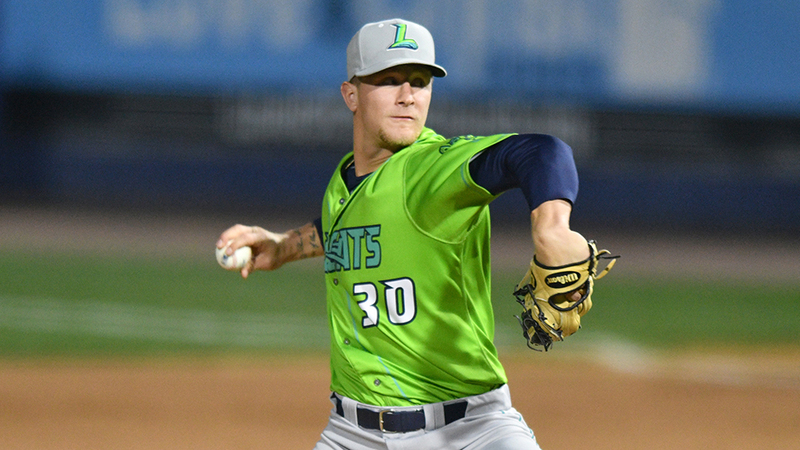 Entering Sunday's matinee against with Myrtle Beach, Class A Advanced Lynchburg was looking anywhere for a spark. The Hillcats were losers of seven of eight, getting outscored during that stretch, 53-23, and totaling 16 runs in those seven defeats. Their starting pitcher, Zach Plesac, took the mound in search of consistency. Both he and his team found just what they were looking. Plesac needed only 74 pitches to toss a two-hitter for his first career complete game as the Hillcats blanked the Pelicans, 4-0, at Calvin Falwell Field. He was perfect through four innings and ended up facing one batter over the minimum, striking out three without issuing a walk. Neither the Lynchburg staff nor its starter had specific set plans to test Plesac's endurance on Sunday. After giving up eight runs on 10 hits over 4 2/3 frames in his previous outing, the 2016 12th-round Draft pick said his only goal was to get to six innings with improved consistency and let the rest take care of itself. "I just took it inning by inning and treated each one as a new ballgame. The game can change so fast if I let it," he said. "I knew I had to get ahead and throw strikes. We had a nice, tight battle going and once our team got on the scoreboard, I wanted to keep the other team off it." Perhaps the biggest key, Plesac said, was trusting his defense. Lately, he's struggled trying to do too much on each pitch. His success on Sunday came in getting ahead early in the count while commanding his fastball on both sides of the plate before unleashing his changeup to get early contact in the zone or his slider or curve to keep the Pelicans off-balance. "I found myself just trying too hard out there lately," he said. "I needed to trust myself and throw strikes, command the zone and not try to throw too hard. "I was trying not to make every pitch a two-strike pitch. I needed to throw strikes and pitch to contact rather than pitching for a swing and a miss. I need to be able to last six innings, and I was more dialed in and focused. I could keep them off-balance, hit my spots and throw with conviction. Trying to do too much can get you into trouble." Plesac's defense was there for him. He recorded just one strikeout through four perfect innings before giving up a leadoff single in the fifth to Cubs No. 25 prospect Wladimir Galindo. Jhonny Pereda followed with a hard grounder to second baseman Dillon Persinger, who started a double play. "Having them play so well behind me really gave me a confidence-boost," Plesac said. "I found myself able to stay level throughout the game, knowing there were going to help behind me." Plesac -- the nephew of former big league reliever Dan Plesac -- said he's finally coming back to full form after undergoing Tommy John surgery in April 2016, a procedure that ended his college career at Ball State. Despite the health concern, the Indians took the right-hander in the 12th round. Plesac rehabbed that summer and fall before making his professional debut with Class A Short Season Mahoning Valley last June. He was promoted Class A Lake County in August but lasted five innings just once in 13 starts in 2017. If Plesac can build off the shutout and make endurance, efficiency and consistency his trademarks, he said Sunday could be a turning point in his brief tenure with the Indians organization. "It shows how hard Ive worked," he added. "I've known all along that I could play professional baseball. Tommy John was just something I had to go through and suffer with, but I knew I could get back to what I could do best. I'm not out there trying to impress anyone or prove anyone wrong. It's all about working hard and helping people win. The rest takes care of itself." The Hillcats scored the only run Plesac needed in the third on a sacrifice fly by Indians No. 27 prospect Mitch Longo. They broke open the game with a three-run sixth as Li-Jen Chu drew a bases-loaded walk, Longo scored on a forceout and Alexis Pantoja was balked home.